The “My Monkey” Series came about because of my love for My Monkey, Zip. My interest in monkeys began when I was a child. I became ill around six years old with scarlet fever and was quarantined. It was normal in those days for a sign to be placed in your yard to show that no one was allowed in the home due to disease. I was not allowed visitors and was confined mostly to my room. I felt so bad. My parents say I was a very sick little girl. Visitors were not able to see me but they did come to the door and drop off gifts like books, puzzles and stuffed animals. During this time, my grandmother, Mur, dropped off a precious gift, MyMonkey, Zip. I have found comfort in and loved monkeys ever since. As a single adult, My Monkey became my traveling companion. He traveled all over Europe with me. Now when my husband and I travel, I feel compelled to take My Monkey. Reluctantly, my husband agrees. Part of the series is Where My Monkey Gets to Go. Other ideas come from experiences from my own childhood and those of my children. 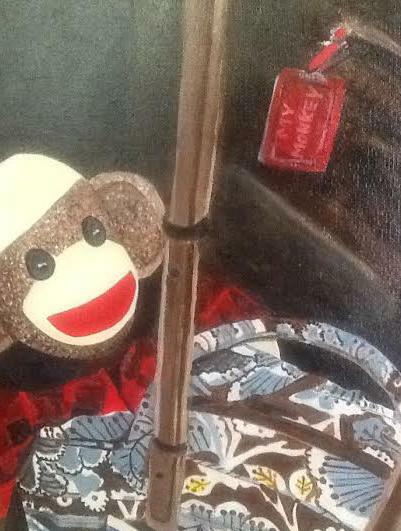 This is only a glimpse of My Monkey series ... there are many more in the works. MyMonkey constantly inspires me. I think it is the big SMILE! It's so easy to be happy when you have MYMonkey in your presence. As you enjoy MyMonkey series I too hope you will be Happy Now!